A 50,000-volt shock from a Taser is powerful enough to immobilize a person, but how does such a strong jolt affect the brain? A burst of electricity from a stun gun can impair a person's ability to remember and process information for about an hour after the jolt, new research suggests. The findings may have implications for the way police handle tased suspects, said Robert Kane, one of the three researchers who spearheaded the study. People who have been shocked with a Taser may be even less aware of their rights if they can't process the information they're told after being jolted with electricity, Kane said. "In order to give up your right to remain silent, which would allow the police to question you during that custodial interrogation, you have to be able to give a knowing and valid waiver," Kane said. "You have to be of sound mind, you have to know what you are doing and you have to understand the consequences of talking to police." The study didn't assess whether people understood their rights, but rather examined their cognitive functioning and memory after being tased. It's the first research of its kind to test thought processing in people after they experienced such a shock, said Geoffrey Alpert, a professor of criminology at the University of South Carolina, who was not involved with the research. "They really hit on something that I think is impressive," Alpert said. "After a police [officer] has tased somebody, [the person who was tased] might not be able to respond as we expect them to." For their study, Kane and his colleagues recruited students from Arizona State University, excluding people who have conditions that are commonly associated with death after being tased, such as individuals with a history of drug use or heart conditions. In total, 142 students agreed to be tested and tased. The punching bag is meant to simulate physical activity that some suspects experience before being arrested, such as running from or tussling with the police, Kane said. However, unlike in a real crime-fighting situation, students laid on a cushioned mat before they were tased, so that they wouldn't fall over when being shocked, he added. Tasers work by overwhelming nerve signals, which causes involuntary muscle contractions and impairment of motor skills, according to Taser International, the company that manufactures the Taser stun gun. In fact, one student in the Taser group didn't mention he had a torn rotator cuff and ended up dislocating his shoulder during one of the tests, Kane said. But that was the only accident during the study, he said, and the student was able to return for the follow-up cognitive tests. After the students were shocked, the researchers tested the participants' cognitive skills 10 minutes later, an hour later, a day after and a week after. "We were looking at, how long does it take for them to return to baseline, assuming there is a change?" Kane said. Students showed the greatest variability on the so-called Hopkins Verbal Learning Test, which can indicate anything from mild cognitive impairment to full-blown dementia, Kane said. During the test, the students were given a list of 12 words in three categories -- camping, marshmallows, storytelling and fire might share one category, for example -- and were then asked to repeat them back. Then, 20 minutes later, the participants were again asked to recall as many words from the list as possible. Students who were tased did significantly worse than the control group. On average, they lost about five points on the test 10 minutes after the shock, with some students scoring within what is considered a normal range and others testing positive for mild cognitive impairment, Kane said. Compared to the students who were not shocked, the tased students had significantly reduced cognitive functioning, Kane said. "It really affected some of them," he said. "Some of them started to cry. They felt diminished or overwhelmed." Most students, but not all of the tased students, recovered to their baseline after an hour, the researchers said. It's unclear why getting tased affects some people more than others, but the scientists plan to study this more in the future, Kane said. Tasers have saved hundreds of thousands of lives by temporarily neutralizing potential threats, according to Taser International. 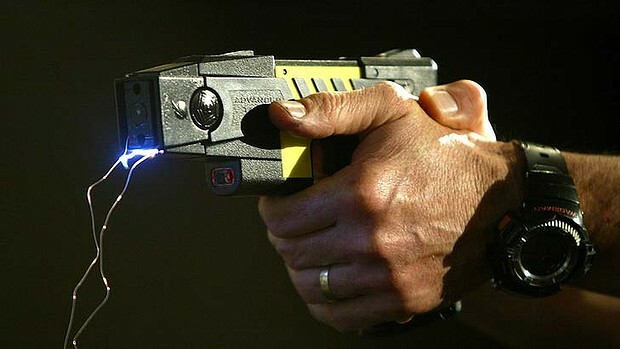 However, the use of Tasers has also resulted in about 400 deaths between 2001 and 2008, according to a study published in 2013 in the journal Police Quarterly. "Basically, it's a very good tool if used properly, but unfortunately, it's not used properly all of the time," Alpert said. He referred to what he called "lazy cop syndrome," when officers use Tasers "too early and too often." Matthew Hickman, an associate professor of criminal justice at Seattle University, who was not involved in the study, said he would pick getting tased over getting pepper-sprayed or beaten with a police baton but added that the new findings raise some alarming concerns. "That kind of infringement on liberty we should take pretty seriously," Hickman said. "And we should make sure justice is administered fairly." "[The Taser is] a positive thing," Hickman said. "But we need to be careful, and we need to look into these questions, like whether it has some unexpected side effects, like cognitive impairment in the immediate aftermath." The new study is still preliminary research, and Kane and his colleagues have yet to publish their results. But the findings suggest that police officers should consider the consequences of tasing suspects, such as whether the shock may hinder the individual's ability to process new and crucial information, including Miranda rights, Kane said. "It doesn't cost anything to wait, and to let somebody fully recover after being tased before the police start to ask the questions," Kane said. "It just levels the playing field." Follow Laura Geggel on Twitter @LauraGeggel and Google+. Follow Live Science @livescience, Facebook & Google+. Original article on Live Science.